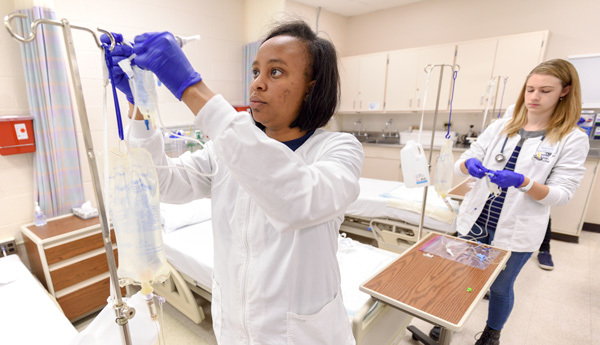 The Accelerated Bachelor of Science in Nursing Program (BSN) is designed for the individual who already has completed a baccalaureate program in another area of study from a regionally accredited college or university and wishes to obtain a degree in nursing. The Accelerated BSN is a four semester program beginning in the summer semester. Admission occurs at summer semester only. Students will progress through the curriculum taking the courses as they appear in the program plan. Students will complete the program in August of the next year with a baccalaureate degree in nursing. The deadline to apply for the next May class is the preceding Dec. 1. Applicants must meet specific admission requirements and all prerequisite science courses must be completed within five years of application to the program. Prerequisite science courses completed within five years of application to the program. Science courses must have a lab component. Prerequisite science courses must have a cumulative 3.0 GPA on a 4.0 scale. Important: Completion of all admission criteria does not guarantee admission to the accelerated program. Copies of your transcripts should be submitted along with the Second Degree BSN Form to the Student Success Center in the College of Health Professions. You will receive a written evaluation of the prerequisites you have completed along with those that need to be completed. From this point forward, the student must maintain close contact with the coordinator in order to ensure proper progression towards entry into the program. Prerequisites may be completed at any regionally accredited university or community college. This course work must be completed by the end of the spring semester prior to the summer of entry into the program. If you are not a University of Akron student, you will receive written instructions on how to formally apply to the University of Akron and the School of Nursing once prerequisites are completed. If you are currently a University of Akron student, you will receive instructions on how to formally apply for the accelerated program. If you are interested in applying for this program and have any questions, please contact Regena Ellis, Student Enrollment Counselor for the accelerated option. She can be reached at (330) 972-7554 or e-mail her at mailto:ellisr@uakron.edu.